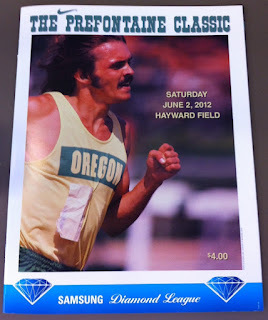 It turns out, last night was just a warm up for what the fans got to see today at the 38th Prefontaine Classic. Temps were in the low 60's and it was absolutely beautiful for a rain free event. 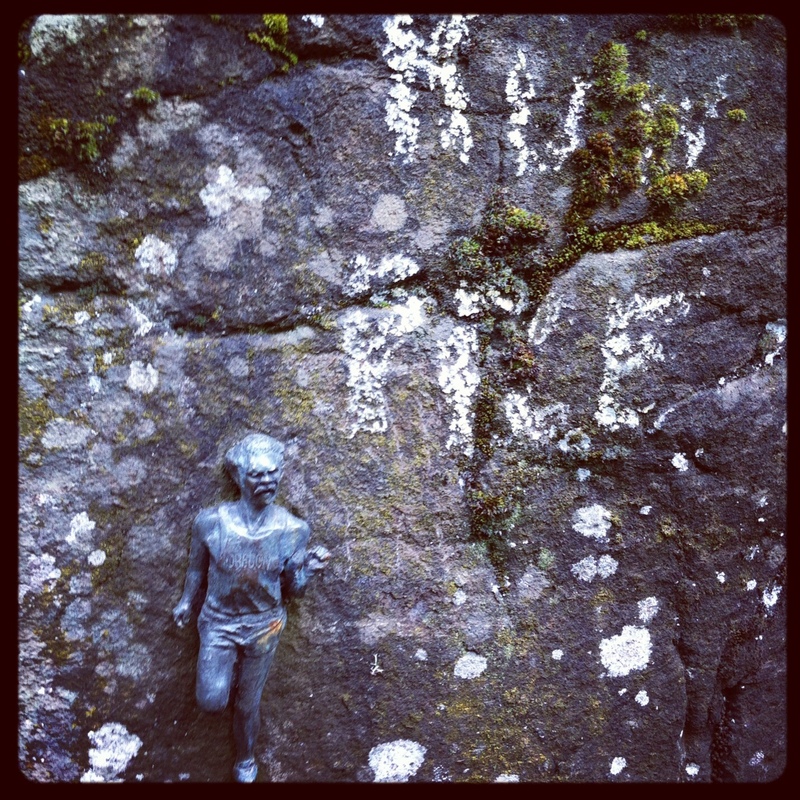 Not always a given in the Pacific Northwest. Lashawn Merritt kicked things off in the Men's 400 meters with a down-the-stretch win over the disqualified Kirani James (false start/ran under protest). His time wasn't anything groundbreaking in 44.91, but more importantly, he was neck and neck with James with 100 meters to go and was able to go to the arms and shift gears on the 2011 World Champion. A confidence booster and a nice scalp for Merritt. Jeremy Wariner, on the other hand, didn't look so good and will have his hands full in just making the team. The Men's 100 meters was up next and although not getting the best of starts, Justin Gatlin was able to come back on Nickel Ashemeade and run a very strong 9.90 in a wind legal +1.3. On the American front, Trell Kimmons (10.04), Walter Dix (10.04), Darvis Patton (10.05) and Michael Rodgers (10.07) all showed how close the trials are going to be at the distance. This isn't even figuring Tyson Gay into the discussion. The Women's Steeple was a tale of two races. Kenyan Milcah Chemos led Ethiopians Sofia Assefa and Hiwot Ayalew in the first pack and Brit Barbara Parker and American Emma Coburn led the second pack. Chemos won the event in a World Leading and Meet Record time of 9:13.69. Coburn had a big 12 second PR in her first steeple of the season, running 9:25.28; firmly cementing herself as the favorite at the trials. This was the #4 US time ever in the event. Sara Hall battled back from an early season slump with a respectable 9:42.96. She'll be on the fringe to make this team in 3 weeks, with Coburn, collegian Shalaya Kipp, Stephanie Garcia and Bridget Franek to deal with. The Men's 110 meter Hurdles was one of the highlights of the meet as Liu Xiang showed his impeccable form in running a World Record tying 12.87 into an illegal wind of +2.4. He was extremely excited and threw up a Tiger Woods-eque fist pump to the crowd after his victory lap, draped in the Chinese flag. It's a real shame he was injured during the Beijing Olympics, but it's nice seeing him return to form. Aries Merritt also broke 13 in a very nice 12.96. Behind him, Jason Richardson, Dexter Faulk and David Oliver were all separated by .02, showing how tough it will be to make the London team. The Women's 3000 meters was up next and like the Steeple, it was a tale of two races. Former convicted EPO user, Mariem Selsouli ran away from the always strong Sally Kipyego in 8:34.47, a World Leading time and Meet Record in the seldom run event. The Americans were about 15 seconds back with former Georgetown Hoya, Liz Maloy, outkicking former Tar Heel Brie Felnagle for third in 8:50.95. Unbeknownst to me, Maloy has the A Standard, as she ran 15:15.34 in Lignano, Italy last year. She'll be sharpening up to make a run at the 5000 team. Lisa Uhl was next in a PR of 8:52.95, with Molly Huddle, Amy Hastings, Jackie Areson and Renee Baillie just behind her. All were under 9:00. Angela Bizzarri was back in 9:14.71 and appears to be coming off injury. Tough timing, but she'll have a few more weeks to prepare. The Women's 200 meters followed and Allyson Felix continued to put on an Olympic year display as she erupted down the homestretch (in full bodysuit), leaving Carmelita Jeter in her wake, running an excellent 22.23, just .01 off Kimberly Duncan's World Leading time. The question continues, will she run the 100-200 double or the 200-400? The Women's 400 meters kept it hot with Sanya Richards-Ross, or S-double-R, as the meet announcer dubbed her, running a World Leading 49.39; her best time since 2009. It took sub 50 to make the top three here as Richards-Ross nemesis, Amantle Montsho, was second in 49.62 and Novlene Williams-Mills was third in 49.78. The Men's 5000 meters was one of the most anticipated events of the day and it certainly lived up to it's billing. The field opened up in a conservative 64 second lap before going through 5 62's in a row. 3 63's followed before it slowed to a 64, and then the race started. The last two laps were covered in 60, and then 56, with Olympic favorite Mo Farah taking the win in 12:56.98 over Isaiah Koech (12:57.63). The third finisher was the most exciting to the Hayward faithful. Galen Rupp finished strong in a new personal best of 12:58.90. This was an 8+ second PR, his first time under 13 and the first time an American has under under 13:00 on US soil. He also finished one spot ahead of the great Kenenisa Bekele. While it's known that Bekele is recovering from injury and is racing into shape, it's still a nice scalp for Rupp. After the meet, Let's Run's Weldon Johnson and I sat in the press box and witness Rupp and Farah jogging 75's around the track for 2 miles in lane 3, while Coach Alberto Salazar watched. There is no finish line! The Men's 200 meters was the Wallace Spearmon show as he looked relaxed up the homestretch winning clearly in 20.27. Dix was scheduled to run the double, but was a DNS (did not start). There was rumor of injury. Let's hope that's not the case as the Men's 200 seems to be a thinner event for the US Team. Closing the show was the always exciting Bowerman Mile. There was a strong contingent of Americans in the field with Leo Manzano, Lopez Lomong, Bernard Lagat, David Torrence and Andrew Wheating ready to take on the World's best. Asbel Kiprop overcame last years defeat and got his third win at Pre in 3:49.40. David Torrence was the first American in a personal best of 3:52.01 (he'll be doing a "5 Questions with" next week). Behind him was Manzano (3:53.07), Lagat (3:54.28), Lomong (3:55.14) and Wheating (3:56.77). Wheating looks to have his hands full over the next few weeks as he prepares to make a return bid to the team. Be prepared to see a slew of guys attempting the 800/1500 double as the 800 is at the beginning of the trials and the 1500 is at the end. 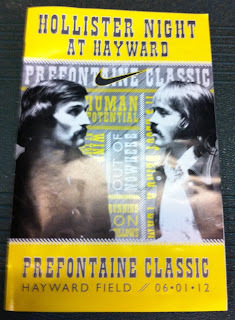 Full results for the Prefontaine Classic (including Hollister Night) are here on the Diamond League website. After next week's Adidas Grand Prix in New York, all attention will turn to the trials. Not everyone has Olympic A Standards yet and it looks like the Diamond League Paris meet the week after the trials will be the final chance to chase the A before the Olympics (if trials qualifiers don't have them yet). It's an Olympic year and this is as exciting as it's gets for track and field fans. The stands were full and the crowd was into it. 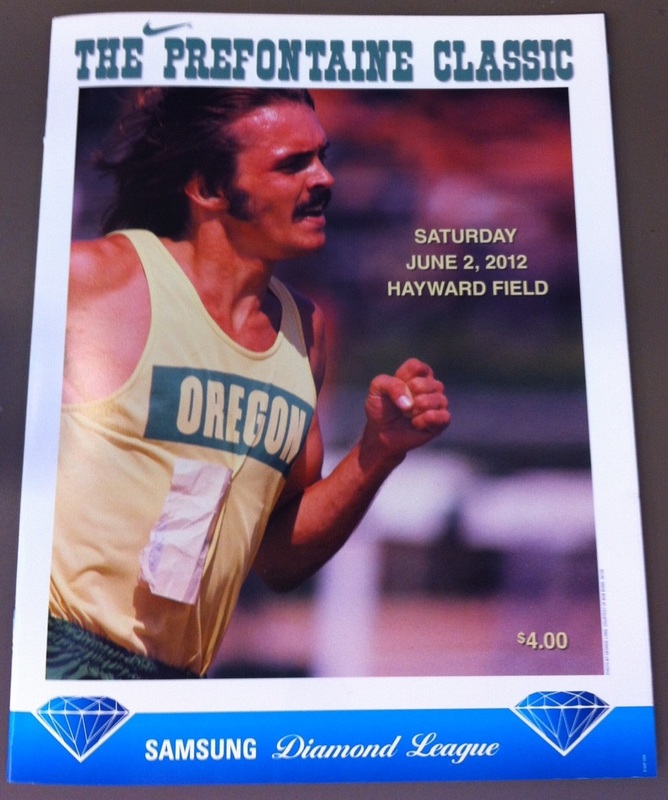 I'm glad to be a part of it and can't wait to return to Eugene for the trials in three weeks.